As more and more people own iPods, Zens, and Zunes, and use those players in noisy environments, in-ear-canal headphones—commonly known as “canalphones” or “in-ear monitors”—have become increasingly popular. As a high-quality option for replacing the cheap headphones included with portable music and media players, the selection of canalphones has, over the past decade, evolved from a few expensive models to a wide-open market with dozens of choices across a wide price range. Still, it’s fair to say that most people aren’t familiar with in-ear-canal headphones, which differ considerably from traditional headphones in terms of fit, sound quality, and use. We’ve put together this primer to help you understand what makes canalphones unique and why you may (or may not) want to give them a try. What are in-ear-canal headphones? Unlike standard headphones, which use relatively large drivers (speakers) and fit on top of or around your ears, or earbuds, which use fairly small drivers and sit loosely in your outer ears, in-ear-canal headphones use very small drivers and actually fit inside your ear canals (thus the name canalphones). In fact, using either rubber eartips in various sizes, or foam eartips that expand to fit any size ear canal, canalphones are designed to seal your ear canals closed, blocking external noise—much like a pair of earplugs. In fact, many canalphones look and fit just like earplugs. Some of the companies that sell true in-ear-canal headphones includeAltec Lansing, Etymotic, Future Sonics, Shure, Ultimate Ears, andXtremeMac. Prices range from $100 to $900. Canalphones from Ultimate Ears (left), Etymotic (middle), and Shure (right). What are the advantages of in-ear-canal headphones over other styles? Because of their unique design, canalphones have a few distinct advantages over traditional headphones. The most noticeable, obvious the first time you try a pair of in-ear-canal models, is that they block more noise than any other type of headphones—far more than noise-canceling and “closed” over-the-ear models, and, with a good seal, as much as many industrial-level hearing protectors. Another is that because they block so much external noise, when listening in noisy environments, you can listen to music at lower levels than with most other types of headphones. Finally, because of the technology used and the way canalphones seal in your ear canals, they have the potential to produce very good audio quality—some in-ear-canal headphones are among the best headphones on the market, period. What are the disadvantages of in-ear-canal headphones? Canalphones aren’t without their drawbacks. For example, because they seal out external noise, you can’t hear what’s going on around you, which makes it tough to have a conversation—and, worse, makes it unsafe to use them in certain environments. (Although Shure’s new PTH Control module, which we covered in our 2006 Plays of the Year article when we talked about the Shure E500PTH, provides a nifty workaround.) Some people also find canalphones to be uncomfortable, as noted below, and they can be inconvenient to put in and remove, which makes them impractical for environments in which you’ll need to do so often. Finally, most in-ear-canal headphones suffer—to varying degrees—from microphonics, a phenomenon where, because the headphones seal so tightly against your ear canals, bumps and scrapes to the headphone cables are transferred up the cables directly to your ears. These sounds can be very distracting, especially if you’re engaged in an activity, such as exercise, that involves a lot of movement. (Manufacturers have tried to reduce microphonics by using different cable materials and by using designs that reduce cable movement; for example, Ultimate Ears and Shure use over-the-ear cable designs.) Related to microphonics, some people also experience what is known as theocclusion effect, where your voice and other bodily noises—breathing, coughing, eating, etc.—seem louder or unnatural while wearing canalphones. I’ve tried canalphones in the past and found them to have horrible bass and poor overall sound quality. I mentioned above that in-ear-canal headphones are designed to seal in your ear canals. This isn’t just important for blocking external noise; it’s also vital to getting the best sound quality. When you don’t get a good seal, the lower frequencies are considerably lacking, if not missing altogether, resulting in very poor sound quality. So it’s important to find tips—rubber, foam, or custom (see below)—that let your in-ear-canal headphones fit your particular ear canals well. And, of course, as with most audio products, sound quality varies between models—in general, the more you spend, the better overall sound you’ll get. But there are also variations between models at similar prices, and some relatively inexpensive models hold their own against pricier products. That’s wherereviewsand personal auditions come in. And if you were disappointed in the past, the good news is that canalphones are constantly improving, at both the low and high end; you can spend as little as $100 and get impressive performance, or you can go all out and get sound quality that simply wasn’t available a few years ago. Examples of eartips for Shure canalphones: rubber (top) and foam (bottom). In order to make it easier to get a comfortable fit, most canalphones include a selection of eartips—the actual “plug” that covers the headphone-driver enclosure and that sticks in your ear. (Some vendors, such as Shure, call them sleeves.) It’s common for this selection to include several sizes of silicone/rubber tips, each of which usually features two or three ridges or flanges, as well as a set of one-size-fits-all foam tips which expand to fit whichever ears they find themselves in. Some vendors, such as Shure and Ultimate Ears, also include no-flange rubber tips in several sizes. You try out all the various tips to find the one that offers the best seal and the best comfort. 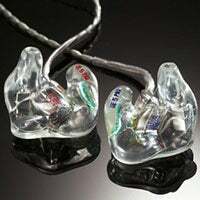 An example of custom earmolds, these on Ultimate Ears’s UE-5 Pro. Another option, if you’re serious about your listening, is to buy custom earpieces. Available from some canalphone vendors directly, or as after-market accessories from third-party vendors, custom earpieces replace the stock rubber or foam eartips with versions that fit your individual ears perfectly. They require a visit to an audiologist, who fills each of your ears with a quick-setting foam; after ten minutes or so, the audiologist removes the now-rigid foam mold from each ear and then sends it off to the earpiece manufacturer, which creates custom earpieces based on those molds. The advantages of these earpieces are two-fold. First, because they’re made for your ears, they tend to fit perfectly; most people who’ve tried them will tell you that they’re much more comfortable than rubber or foam tips. Second, because of the good fit, they tend to let your canalphones shine, so to speak—you’ll get better sound quality than with stock tips. Custom earpieces are available in soft or hard versions; the cost—including the earpieces and the audiologist visit—ranges from as little as $150 up to several hundred dollars, depending on material and vendor. I’ve heard that canalphones are dangerous, given that they sit inside your ear canals. Not necessarily. Although it’s true that in-ear-canal headphones place their drivers very close to your eardrums relative to other types of headphones, and thus have the potential to damage your ears if you listen too loudly, the risk of canalphones is often overstated. The main reason for this is that, because they block a significant amount of external noise, canalphones can often be enjoyed at much lower volume levels than traditional headphones. You don’t have to “drown out” the other noise in your environment just to enjoy your music—you can get the same effective volume level at much lower actual volumes. Canalbuds from V-Moda (left) and Sennheiser (right). What are these canalbud things? 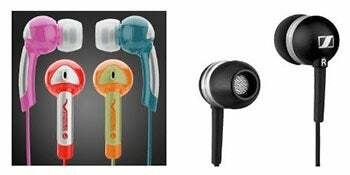 Over the past few years, an increasingly popular variant of in-ear-canal headphones has been what we call canalbuds. Halfway between earbuds and true canalphones, canalbuds use small rubber eartips that sit just inside the ends of your ear canals. They don’t seal out as much external noise as full-fledged canalphones, and they generally don’t sound quite as good, but they’re easier to put in and take out, are less expensive, and, perhaps most important, are more comfortable for many listeners than true in-ear-canal models. Good examples of this style of headphone are Sennheiser’sCX 300, Sony’s EX 70 and 80 lines, and V-Moda’sBass FreqandVibe. Prices of canalbuds range from under $50 to $100. So what’s your take on canalphones? We like ’em. Seriously—many of our editors have at least one set of canalphones, and a number of us have multiple models. You can also find around the office a good number of sets with custom earpieces. In many ways, in-ear-canal headphones combine the best of other types of headphones—great sound quality, stellar noise isolation, low power requirements, and even good comfort—in an ultra-portable package.